A and L: Thus far, what place that you’ve designed is your favorite, and why? JJ: I have two favorites, and they were both firsts. My first project, Horton Plaza in San Diego, was the culmination—in one project—of all the new, community-oriented ideas for architecture I had been pondering for years. It was an incredible battle because it went completely against the grain of the way everything had gone to that point. But it transformed San Diego in a way that was unbelievably meaningful. In the first year, 25 million people visited it.This was hard for many to comprehend. Other suburban retail centers that were ideally located along major freeways with huge surface parking lots typically attracted nine million visitors; I don’t think anyone expected an urban center sitting in a blighted urban core to do so well. Horton Plaza was not the most extraordinary structural architectural accomplishment; it was a series of painted stucco boxes. But it completely defied what the world had seen in the way of shopping centers, which were just big tubes with air conditioning and florescent lights. Horton Plaza was all outdoors and it was composed of many, many little buildings much like the Italian hill towns with circular buildings and triangular buildings patched together with squares and plazas. And that’s essential to what we do. We don’t design “things,” don’t focus our energies on advancing forms for forms’ sake. What we do is design places and environments people really love. Horton Plaza proved that we were right. You don’t have to do something that’s reproductive and replaces some- thing else, nor do you have to use a lot of money.You just have to be smart about thinking about how peo- ple will experience the place. My other favorite is Canal City Hakata, the first project I ever built outside of the United States. It was the first waterfront project I did.The site was located along the Naka River in Fukuoka, so I decided to metaphorically bring the river into the project, using a manmade canal as the main armature and organizing element for the dense mixed-use place of retail and restaurants, hotels and office buildings. Working in Asia—and particularly in Japan—allowed me to fur- ther break from the formulas that are all too often applied in American developments and really dig into the impact of color and light and movement and space in creating a memorable experience. A and L: What structure that you haven’t designed is your favorite and why? JJ: My favorite place of all, I think, is Venice, though almost anything in Italy delights my senses. For me, it is always the spaces between buildings that are innately special. The Venetian language of architecture is incredibly refined and evolved. It’s very colorful; it’s very much about the space between; and it doesn’t have anything to do with automobiles, because there were no automobiles—just boats. When I was an architecture student at USC, I won a fellowship grant to travel and just do whatever I wanted to for a year. During my trip, I discovered my favorite part of the world to be an Italian hill town that was formed of many, many buildings of stone and other natural materials that were piled up against each other.The hill town’s organic streets are the ultimate pedestrian experience, wrapping the hill with narrow passages and opening up into courts and plazas. By studying the hill towns, I learned the beauty and power of experience that results from simplifying and reducing the landscape to a series of hill zones with spaces in between.This got me to understand that what we’re really designing is not the building, but the spaces between the buildings. A and L: How are you incorporating more energy efficient fea- tures into your designs? 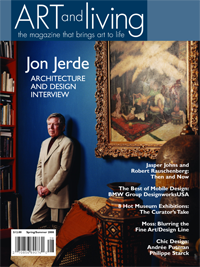 JJ: Jerde has always been about the very sustainable notion of open spaces and nature and places that will last. Namba Parks is an example of this. Namba Parks is a project in Osaka, a city that is flat and crowded and dominated by concrete buildings and pavement, and was designed as a series of levels crowned by a sloping, green rooftop park that is very visible in the gray city. From every floor of the project’s retail center, you walk directly into the rooftop park. Running through the middle of the site is a canyon-like pedestrian path with interesting spatial qualities created by the rising walls and the falling shadows. When I visited Osaka, I could not find a park outside of the imperial parks. So I thought the rooftop park, which is one of the largest in Japan, would be a gift to the people and city of Osaka. There are more than 40,000 plants on the rooftop park, and it is crowded with people even before the retail center beneath opens for business. The project has housing and offices along with the retail. And it is next to a major train station, which is a sustainable notion. A and L: What is your opinion on integrated properties that contain housing, shopping, working, etc.? Is that the wave of the future? JJ: I guess you could say mixed-use is the wave of the future, but it is really the way of the past. Mixed-use projects are truer to real life, truer to the way people live. In the 1950s, when whole new cities were being conceived in the suburbs, they did it in an orderly way. They put houses in a box over here, retail in a box over there and an office park out there. They would sort everything to the point that cities, which naturally evolved to a more vertical orientation, were zoned horizontally. Mixed-use reintroduces the complexity of urbanism that makes cities so vital and full of energy. I think that’s one of the things I look for- ward to protecting here; it has always been one of my passions. A and L: What was your inspiration for the Bellagio? JJ: By the time I designed Bellagio, I had worked for Steve Wynn for years. Wynn is a genius—he really is a genius. With Wynn as the teacher, you learn. Once we learn something, we refine it to make it better and better. Bellagio is a really fan- tastic project. People love it because of the design. All Las Vegas casinos looked alike until Bellagio came along. Bellagio started because my wife and I went to Lake Como on our honeymoon. I am nuts about Lake Como. It’s all about a big lake with these amazing buildings sitting on the lake, a highway behind the buildings and a mountain forming the backdrop to it all. I was still in Italy and called Steve and said, “You’ve got to come up and see this place.This is what it’s all about.” Similar to Lake Como, Bellagio is defined by a large, central lake surrounded by jewel-like buildings with a main street and hotel tower rising in the background. A and L: In a recent AIA survey, non-archi- tects placed the Bellagio at number 22 on the list of great American buildings. Why do you believe it’s such a favorite? JJ: Bellagio is experiential architecture—we don’t design things, we design experiences. It has more to do with creating a story. People don’t emotionally fall in love with modern architecture like they have fallen in love with Bellagio, Namba Parks, Horton Plaza, Canal City Hakata and so on. I’m just proud of the impact these places have had on people. Pictured: The lobby of the Jerde-designed Bellagio featuring Dale Chihuly’s Fiori di Como above. Courtesy of MGM Mirage.